Over the next few weeks I’m publishing the entirety of my free report on “How to Make Money with Lending Club” as blog posts, so you can access them without having to download the report. Last week we covered How Lending Club Works. If you’d like to read everything ahead of time, go ahead and download the report today! This is probably the biggest question you have right now. What sort of risks does investing in Lending Club carry? How safe an investment is this? Am I going to lose half my money like in the 2008 stock market crash, or half the value of my home, or lose everything in a Bernie Madoff style Ponzi scheme? Before investing in anything, be sure to read the Prospectus that the company is required to file with the Securities and Exchange Commission. No Prospectus? Probably not a company you want to invest in! Lending Club registered with the SEC back in 2008 and has updated their Prospectus frequently since then. Remember that these loans are NOT FDIC insured. You have the potential to lose 100% of your investment. While that risk is extremely small, it is possible. The only guarantee in financial life is FDIC insured accounts or US government backed bonds. Anything else is an investment with risks. I believe that with the proper precautions and understanding of these risks, they can be mitigated and you can achieve a solid return. As you can see, once a loan is more than a month late, the chance of recovery approaches 50%. Once a loan defaults, there is almost no chance of recovery. What cost does the borrower incur by defaulting? A much lower credit score, the hounding by credit collectors, and of course the shame of being a delinquent borrower. While this may be worth it to some people, the vast majority of LC borrowers do make their payments on time and pay off their loans in full. Diversification begins with only investing a certain percentage of your total net worth or investable assets into Lending Club. LC IS NOT A SURE THING. Do NOT put all of your eggs in one basket. After you insure that you are properly diversified in your investments, then you can begin diversifying your Lending Club holdings. Diversification in Lending Club is primarily accomplished by investing in many notes. This chart explains it best. With 800 or more notes, a $20,000 minimum investment ($25 per note), 100% of investors have experienced positive returns. 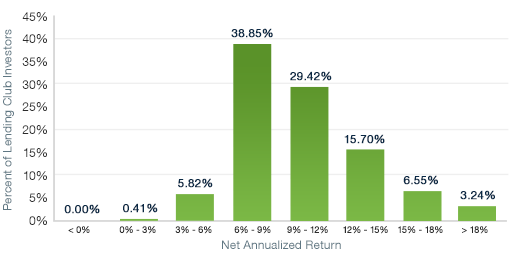 93.76% have experienced returns between 6-18%. Lending Club performs extensive filtering before even presenting loans to invest in. Of the $13.3 billion in loan applications, only $1.6 billion have been funded. That’s 88% of loan applications denied, for a variety of reasons. This filtering process performed by Lending Club ensures that only the top 12% of loan applications are even available to invest in. Once you apply some filters, you can decrease your risk of default even more. There is one additional risk in that Lending Club itself could become defunct and stop operating. The company recently reported it was cash flow positive and is expected to IPO in 2014 and continues to report sound financials. It is led by an experienced management team and although it has originated over $1.5 billion in loans, it still has less than 100 employees, so it keeps costs low. However, bad things can happen, and Lending Club has taken the proper business continuity planning. They also have contracts with the Portfolio Financial Servicing Company, which would take the loans from Lending Club and continue to ensure investors were paid in the event of the company collapsing. Rest assured, while there are no guarantees in life, Lending Club has taken the proper precautions to protect itself and its investors. Next week we'll cover the final chapter of How to Make Money with Lending Club. If you can't wait that long, download the free report now! Thank you for this info on lending clubs. I was not sure about them.